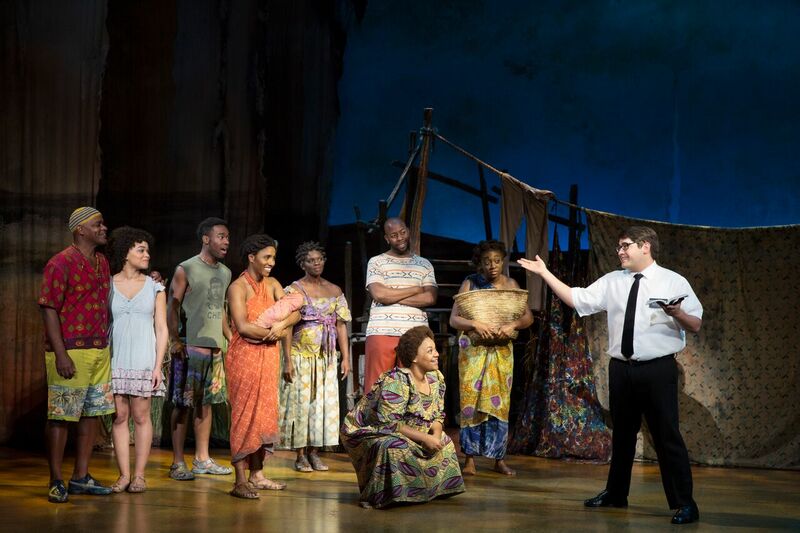 The Book of Mormon at the Orpheum Theatre is a seriously funny satire that pokes fun of organized religion, groupthink and know-it-all white boys. The musical is the winner of nine Tony Awards, including Best Musical, Best Book, Best Original Score and Best Direction from the creators of “South Park,” Trey Parker and Matt Stone. Fans of “South Park will recognize and appreciate the pop culture nerd references and raw, potty-mouth humor. The amazing music, singing and dancing all add to the hilarity and heart of this wildly entertaining musical. The story focuses on a newly graduated class of young Mormon elders who receive their missionary assignments and are sent to spread the word. Our hero, Elder Price (Kevin Clay) wishes for Orlando but gets Uganda instead. His missionary companion is Elder Cunningham, played by Conner Peirson, who gives a hysterically funny and slapstick performance as a needy nerd who has a special relationship with the truth. Upon arriving at their remote and destitute Ugandan village, they realize the danger and difficulties of their mission. They meet and enlist the help of idealistic village girl, Nabulungi (Kayla Pecchioni), whose name Elder Cunningham mixes up with a host of pop culture characters. The Mormon church makes an easy mark, with its bizarre origin story (no offense), as the backdrop to this musical, but really all group think and hypocritical ideologies are targets. The musical’s reputation as a guilty pleasure is legendary and you will laugh out loud at its in-your-face irreverence while blushing at how bad/good it feels. The Book of Mormon, book, music and lyrics by Trey Parker, Robert Lopez and Matt Stone. Directed by Trey Parker and Casey Nicholaw. Choreography by Casey Nicholaw, with Music Supervision and Vocal Arrangements by Stephen Oremus. Playing now through Nov. 18. at the Orpheum Theatre, 910 Hennepin Avenue, Minneapolis. Tickets from $25 – $155 at 800-982-2787 or online at Hennepin Theatre Trust.